Having automated builds that are stable and predictable is so important in order to succeed with CI/CD. One important practice to enable this is to have a fully scriptable build environment that lets you deploy multiple, identical, build envionment hosts. This can be done by using image tooling such as Packer from HahsiCorp. Another option is to use Docker which is what I am using in this post. Using Docker will will crete a Dockerfile that specifies the content of the image in which builds will run. This image should contain the SDK’s and tooling necessary to build and test your projects. It will also contain the build agent for your favourite CI server that will let you spin up a new agent in seconds using the docker image. 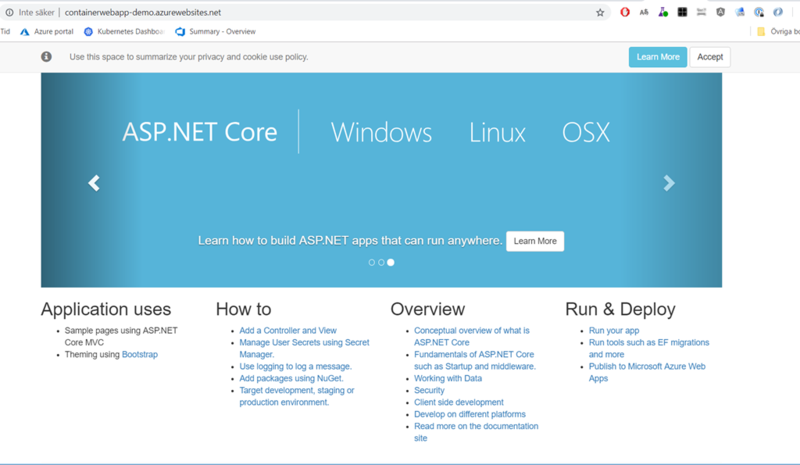 In this post I will walk you through how to create a Windows container image for Azure Pipelines/Azure DevOps Server that contains the necessary build tools for building .NET Framework and .NET Core projects. You need to have Docker Desktop install on your machine to build the image. All Docker images must inherit from a base image. In this case we will start with one of the images from Microsoft that ships with the full .NET Framework SDK, microsoft/dotnet-framework. 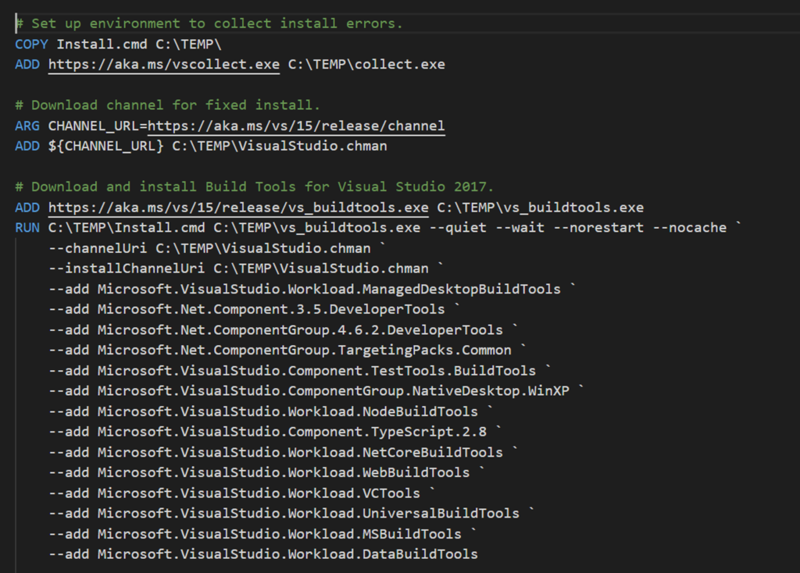 In order to build .NET Framework apps we need to have the proper build tools installed. Installing Visual Studio in a Docker container is possible but not recommended. 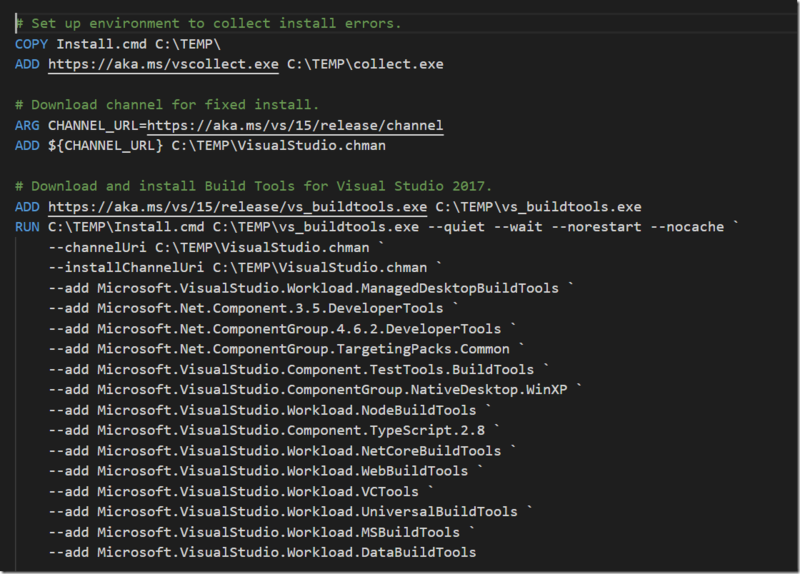 Instead we can install Visual Studio Build Tools, and select wich components to install. In the lines shown below, I’m first downloading and installing Visual Studio Log Collection tool (vscollect) that let’s us capture the installation log. Then we download the build tools from the Visual Studio 2017 release channel feed. 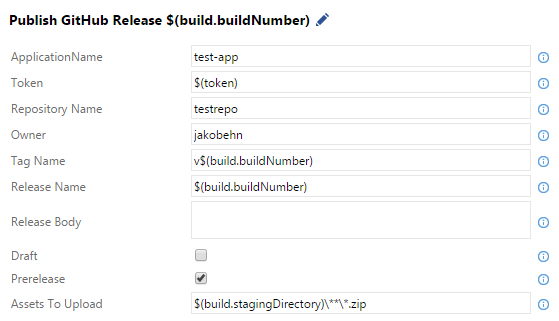 Finally we are instaling the build tools in quiet mode,specifying the desired components. Of course you might wamt to change this list to fit your needs. 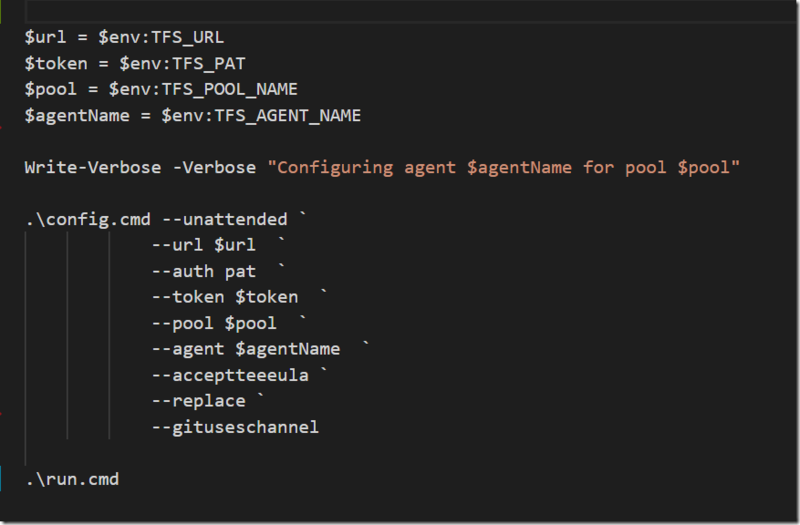 Finally we want to installl the Azure Pipelines build agent and configure it. Installing the agent will be done when we are building the Docker image. Configuring it against your Azure DevOps organization must be done when starting the image, which means will do this in the CMD part of the Dockerfile, and supply the necessary parameters. docker build -t mybuildagent:1.0 -m 8GB . When the build is done you can run docker images to see your image. Using Docker containers for building and running your applications has many advantages such as consistent builds, build-once run anywhere and easy standardized packaging and deployment format, just to name a few. When it comes to running the containers you might look into container orchestrators such as Kubernetes or Docker Swarm. Sometimes though, these orchestrators can be overkill for your applications. If you are developing web applications that have only a few dependent runtime components, another options is to use Azure Web App for Containers, which is a mouthful for saying that you can use your beloved Azure Web Apps with all the functionality that comes with it (easy scaling, SSL support etc), but deploy your code in a container. Best of both worlds, perhaps? 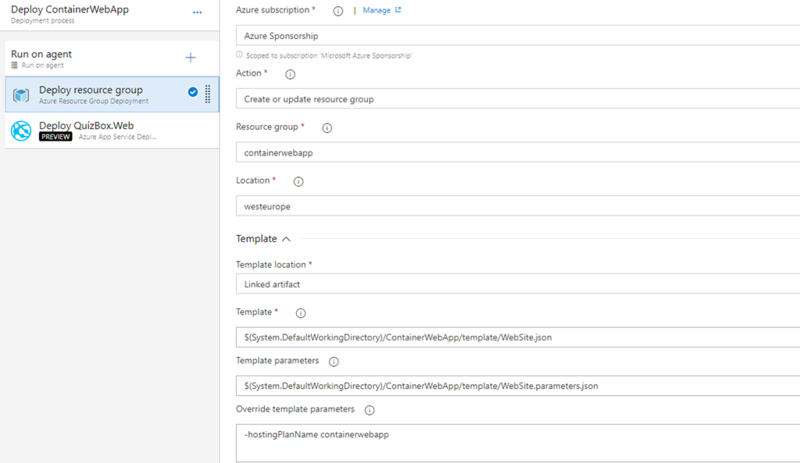 In this post I will show how you can create an ARM template that creates the Azure Web App with the necessary setting to connect it to an Azure Container Registry, and how you setup a Azure Pipeline to build and deploy the container. Now, we need to make some changes in order to deploy this web app as a container. FIrst of all we will change some settings of the App Service Plan. Set the “kind” property to “linux”, to specify that this is a Linux hosted web app (Windows containers for Web Apps are in preview at the moment). For the web app definition, we need to set the “kind” property to “app,linux,container” to make this a containerized web app resource. We also need to set the DOCKER_CUSTOM_IMAGE_NAME to something. We will set the correct image later on from our deployment pipeline, but this property must be here when we create the web app resource. Let’s create a deployment pipeline that will build and push the image, and then deploy the ARM template and finally the web app container. Running this buid should push an image to your container registry. 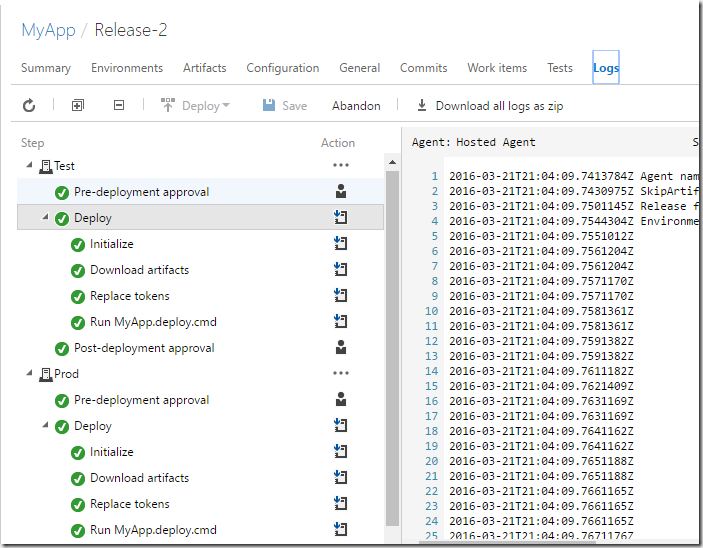 Now we will create a release definition that deployes the resource group and then the container web app. First up is the resource group deployment. 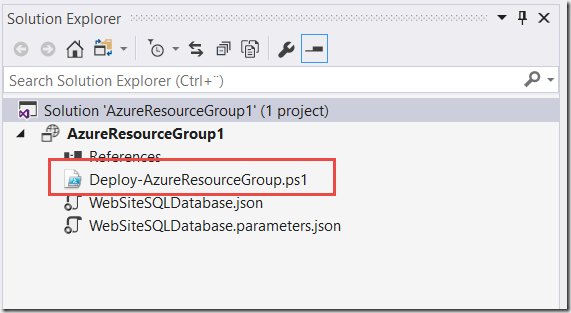 Here we use the Azure Resource Group Deployment task, where we point to the ARM template json file and the parameters file. We also override the name of the app hosting plan since that is an input parameter to the template. 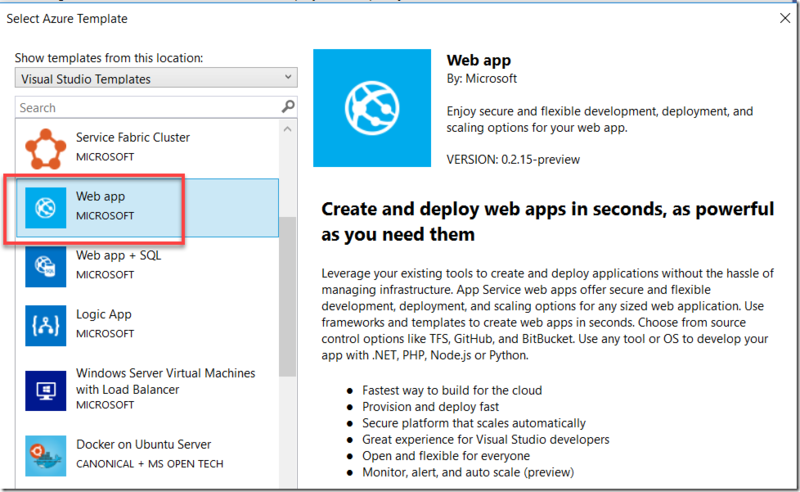 Then we use the Azure App Service Deployment task to deploy the container to the web app. Note that we are using the preview 4. * version since that has support for deploying to Web App for Containers. 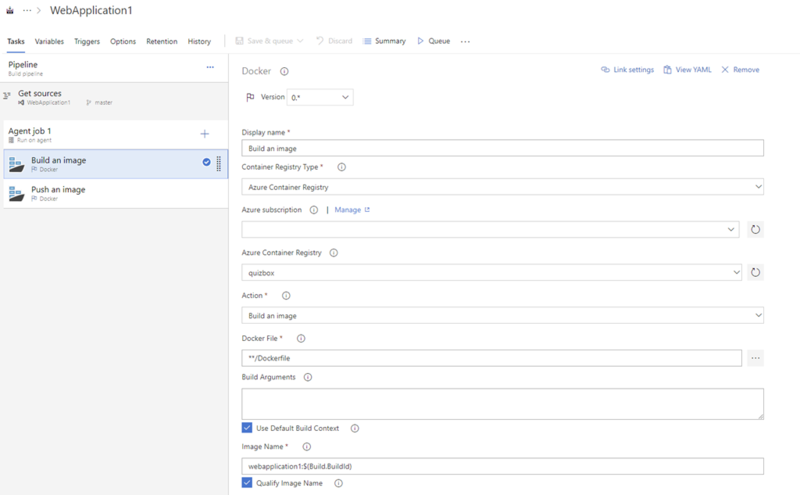 In the rest of the parameters for this task we specify the name of the container registry, the name of the image and the specific tag that we want to deploy. The tag is fetched from the build number of the associated build. Using Docker for compiling your code is great since that guarantees a consistent behaviour regardless of where you are building your code, if it’s on the local dev machine or on a build server somewhere. It also reduces the need of installing any dependencies just to make the code compile, the only thing that you need is Docker. This is an example of a multistage Docker build. The first stage is based on the .NET Core SDK Docker image in which the code is restored, built and published. The second phase uses the smaller .NET Core runtime Docker image, to which the generated artifacts from the first phase is copied into. This results in a smaller Docker image that will be pushed to a Docker registry and later on deployed onto testing and production environments. Smaller images means faster download and startup times, but also since it doesn’t contain as many SDKs etc the surface area for security holes is typically smaller. But, we want to run unit tests also, and then publish the test results back to Azure DevOps. How can we do this? First of all we need to build and run the tests inside the container, so we need to extend the Docker file. In this sample, I have added a XUnit test project called WebApplication1.UnitTests. 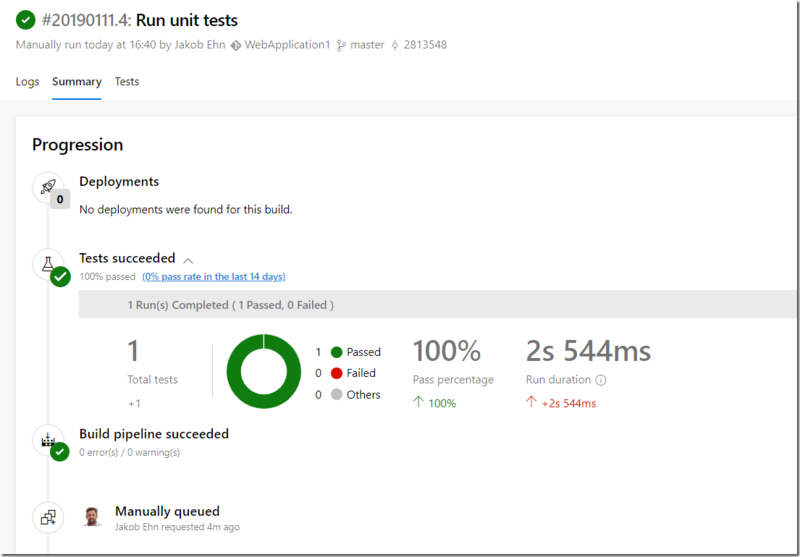 RUN dotnet test "WebApplication1.UnitTests/WebApplication1.UnitTests.csproj" --logger "trx;LogFileName=webapplication1.trx"
Now we are also restoring and compiling the test project, and then we run dotnet test to actually run the unit tests. 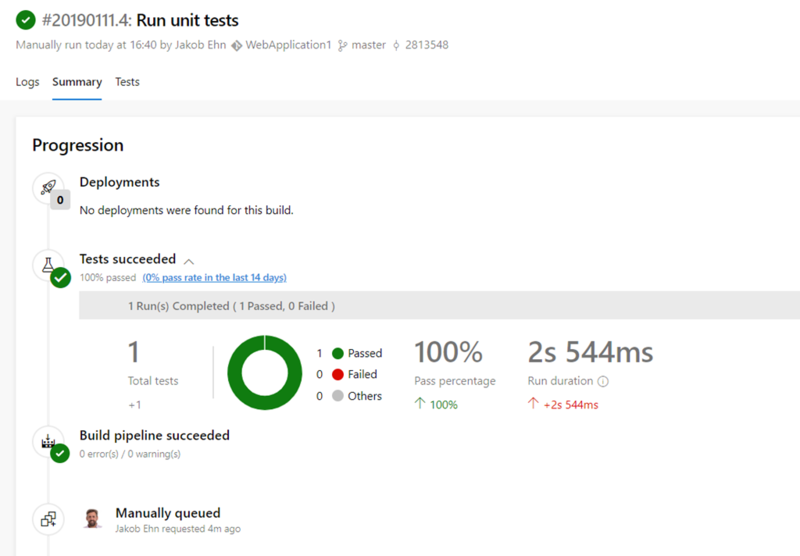 Since we want to later on be able to publish the results of the unit tests to Azure DevOps, we are using the –logger parameter to specify that dotnet test should output a TRX file and we also give it a name for clarity. Now comes the tricky part. When we run these tests as part of a build, the results end up inside the container. To be able to publish the test results we need to access this file from outside the container. Locally we could have used Docker volumes to do this, but this will not work on a hosted build server. docker build -f ./WebApplication1/Dockerfile --target build -t webapplication1:$(build.buildid) . Here we first build the image by using docker build. By using the –target parameter it will only execute the first phase of the build (there is no meaning to continue if the tests are failing). To be able to access the file inside the container, we use docker create which is a way to create and configure a container before actually starting it. In this case we don’t need to start it, just use docker cp to extract the test result files to the host. Today Microsoft announced Azure DevOps, which is partly a rebranding of the existing Visual Studio Team Services but also has some exciting news. The gist of the rebranding is that Azure DevOps is now a suite of service, where each service cna be acquired and used separately from the other ones. If you only want to use source control (and use some other CI/CD system) that’s fine. 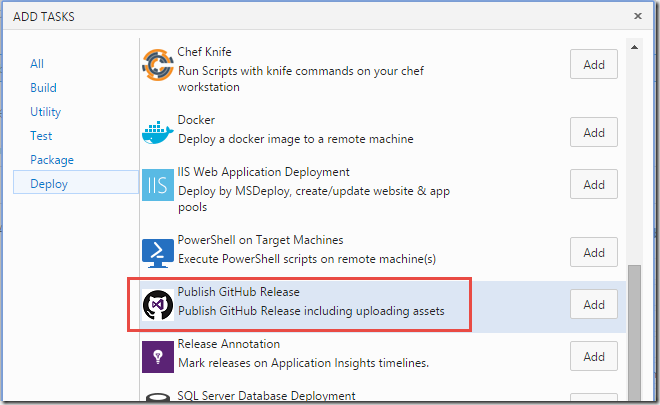 Do you have your code over at GitHub and want to use the CI/CD services in Azure DevOps? Works perfectly! By breaking the whole suite down into smaller services, it will make it easier for customers to find the best fit for their needs, without having to invest in the whole suite. Of course, you will still be able to easily get the whole suite when creating new accounts. CI/CD that works with any language, platform, and cloud. Connect to GitHub or any Git repository and deploy continuously. Powerful work tracking with Kanban boards, backlogs, team dashboards, and custom reporting. Maven, npm, and NuGet package feeds from public and private sources. Unlimited cloud-hosted private Git repos for your project. Collaborative pull requests, advanced file management, and more. All in one planned and exploratory testing solution. In March, Mathias Olausson and I will run two fullday deep dive in continuous delivery and microservices on Azure. During the day you will learn about microservice architecture and how to build and deploy these using container technology and cloud services in Microsoft Azure. Hope to see you either in Gothenburg or in Stockholm! If you are running your applications in Azure, and in particular on PaaS, you need to take a look ARM templates as a way to manage your environments. ARM templates let’s you define and deploy your entire environment using JSON files that you store together with the rest of your source code. The deployment of ARM templates are idempotent, meaning that you can run them many times and it will always produce the same result. 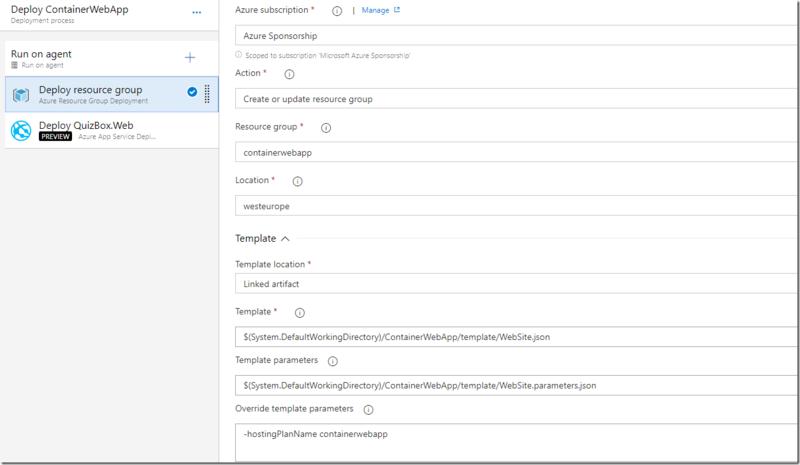 In this post, I will how you how to deploy ARM templates together with your application using Visual Studio Team Services. As you will see, I will not use the out of the box task for doing this, since it has some limitations. Instead we will use a PowerShell script to eexecute the deployment of an ARM template. Defining our ARM template for our environment. 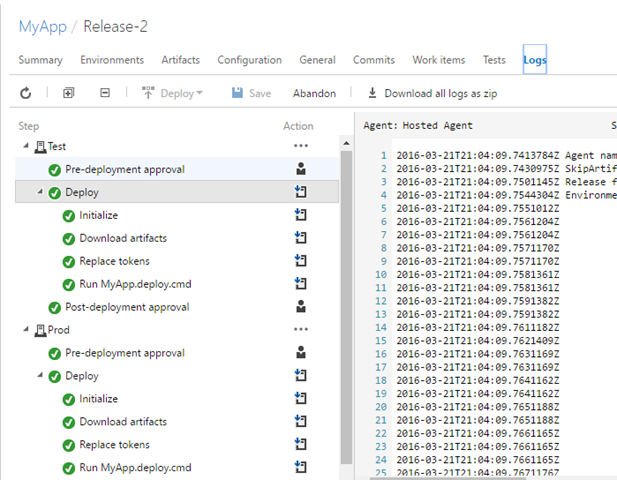 Deploy everything from a VSTS release definition. Let’s get started with the ARM template. In this case, I will deploy an ARM template consisting of a Azure web app, a SQL Server + database and a Redis Cache. The web app and sql resources are easy to deploy, since we can supply all the input from my release definition. With the Redis cache however, Azure Resource Manager will create some information (such as the primarykey) as part of the deployment, which means we need to read this information from the output of the ARM template deployment. Since our web application will communicate with the Redis cache, we need to fetch this information from the ARM template deployment and store them in our web.cofig file. You will see later on how this can be done. When deploying our template in different environments (dev, test, prod…) we need to supply the information specific to those environment. 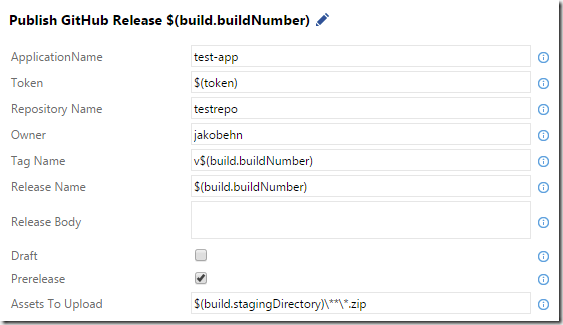 In VSTS Release Management, the information is stored using environment variables. A common solution is to tokenize the files that is needed for deployment and then replace these tokens with the corresponding environment variable. We wil then replace these tokens just before the template is deployed. 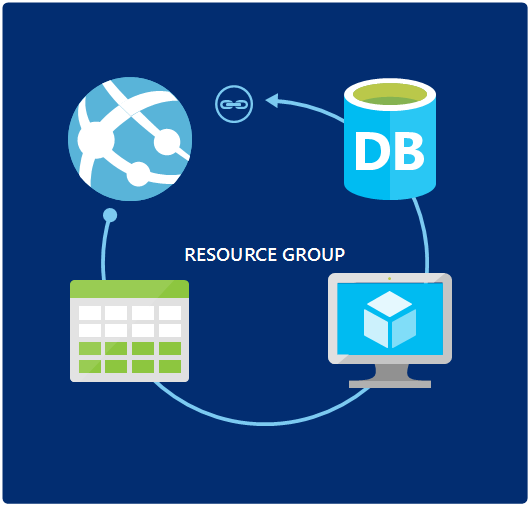 There is an existing task for creating and updating ARM templates, called Azure Resource Group Deployment. This task let’s us point to an existing ARM template and the corresponding parameter file. 2017-01-23T09:09:49.8436157Z ##[error]The ‘Get-AzureVM’ command was found in the module ‘Azure’, but the module could not be loaded. For more information, run ‘Import-Module Azure’. So, to be able to read our output values we need to use PowerShell instead, which is arguably a better choice anyway since it allows you to run and test the deployment locally, saving you a lot of time. When we create an Azure Resource Group project in Visual Studio, we get a PowerShell script that we can use as a starting point. Most part of this script handles the case where we need to upload artifacts as part of the resource group deployment. In this case we don’t need this, we deploy all our artifacts from RM after the resource group has been deployed. The special part of this script is the last three lines. 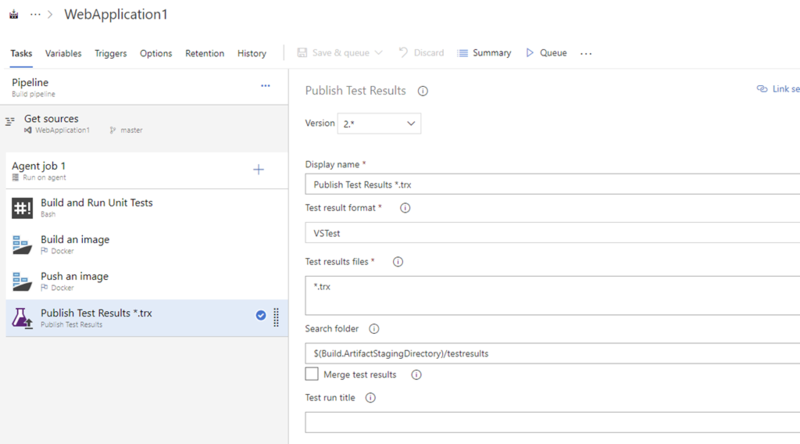 Here, we read the output variables that we defined in the ARM template and then we use one of the VSTS logging commands to map these into variables that we can use in our release definition. The syntax of the SetVariable logging command is ##vso[task.setvariable variable=NAME]<VARIABLEVALUE>. Finally we can put all of this together by creating a release definition that deploys the ARM template. Note: You will of course need to create a build definition that packages your scripts, ARM templates and deployment artifacts. I won’t show this here, but just reference the outputs from an existing build definition. Run the PowerShell scipt using the Azure PowerShell task. This task handles the connection to Azure, so we don’t have to think about that. Now we need to update the tokens in our SetParameters file, that is used by web deploy. 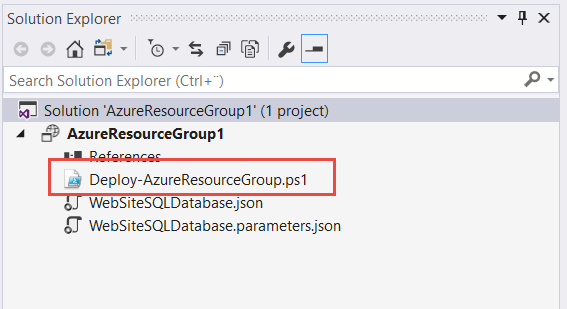 It is important that we run this task after running the deploy azure enviroment script, since we need the output variables from the resource group deployment. Remember, these variables are now available as environment variables, so they will be inserted in the same way as the variables that we have defined manually. 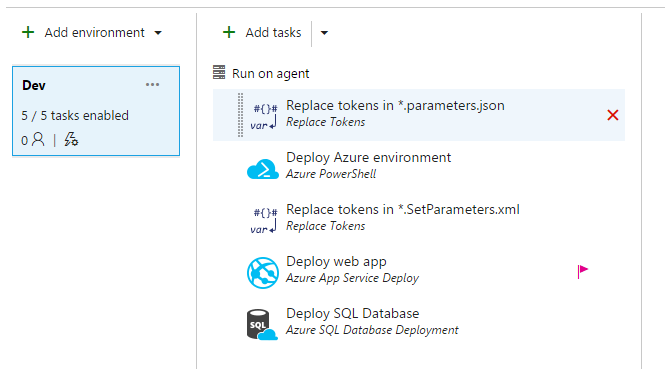 These steps just performs a simple deployment of an Azure Web App and a SQL dacpac deployment. We have decided that it is time to create a meetup group for people that are interested in the Microsoft ALM and DevOps story! Together with Mathias Olausson and a few other people we have created a new Meetup group and announced the first meeting. so there will be something for everyone. The first meeting is set to October 25th, where we will have Jose Rady Allende, a Program Manager on the Visual Studio Team Services tean, join us online to talk about the Microsoft Team Service Agile Transformation story. There are already around 25 people that have signed up for it, so sign up before it gets full! Heop to see you there! This post does not really cover something new, but since I find myself explain this to people now and then, I thought that I’d write a quick post on the subject. 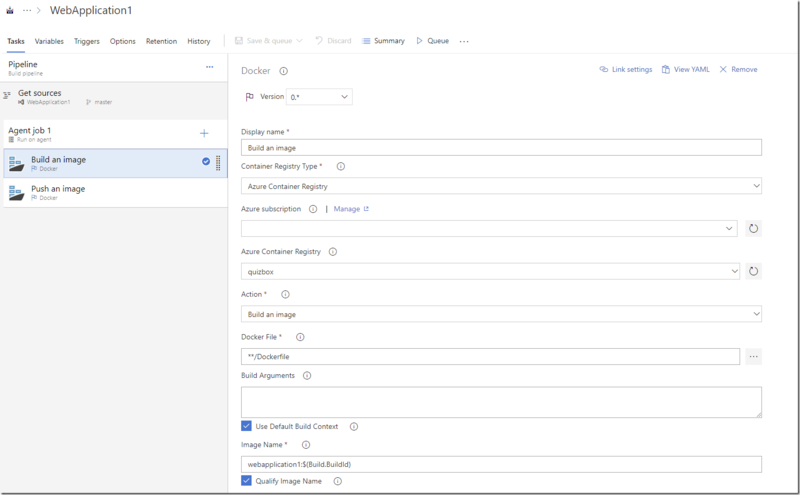 So, we want to create a web deploy package as part of our automated build, and then take this package and deploy it to multiple environments, where each environment can have different configuration settings, using VSTS Release Management. Since we only want to build our package once, we have to apply the environment specific settings at deployment time, which means we will use Web Deploy parameters. As you will see later on, a publish profile contains configurable settings for the web site name and any connection strings,that will end up in the *.SetParameters.xml file that is used when at deployment time. But in order for other configuration settings, like appSettings, to end up in this file, you need to define these settings. This is done by creating a file called parameters.xml in the root of your web application. 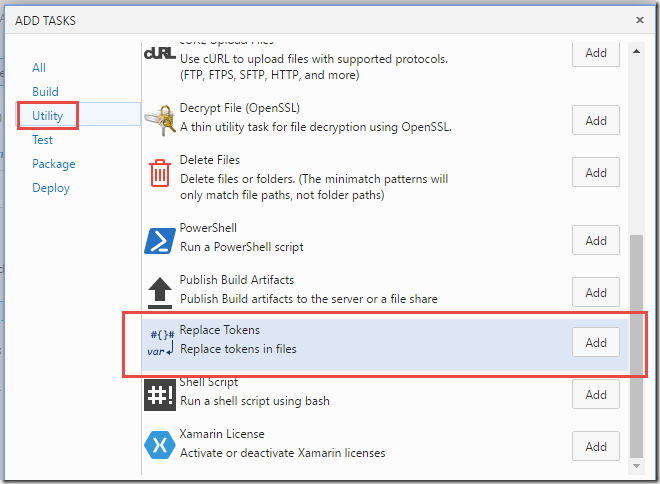 Tip: A fellow MVP, Richard Fennell, has created a nifty Visual Studio extension that simplifies the process of creating the parameters.xml file. It will look at your web.config file and the create a parameters.xml file with all the settings that it finds. In this case, I have three application settings in the web.config file, so I end up with this parameters.xml file. Note that I have set the defaultvalue attribute for all parameters to __TOKEN__. These are the configuration values that will end up in the MyApp.SetParameters.xml file, together with the web deployment package. We will replaced these values at deployment time, by a task in our release definition. 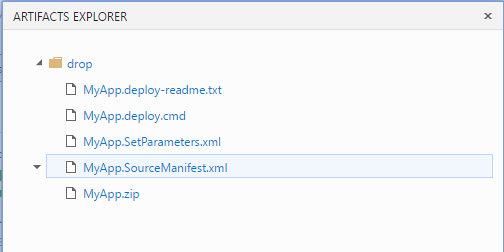 On the Connection tab, select Web Deploy Package as the publish method, then give the generated package a name (including .zip). As the Web Site name, we enter a tokenized value __WEBSITE__. This token will also end up in the MyApp.SetParameters.xml file. Save the publish profile and commit and push your changes. Now it’s time to create a build definition. 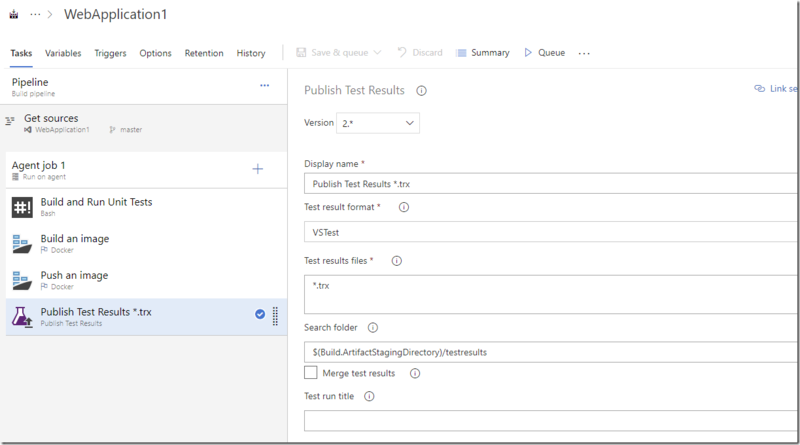 I won’t go through all the details of creating a build definition in VSTS, but just focus on the relevant parts for this blog post. 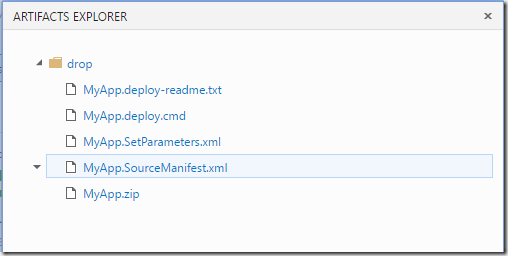 To generate a web deploy package, we need to pass some magic MSBuild parameters as part of the Visual Studio build task. Since we have a publish profile that contains our settings, we need to refer to this file. We also want to specify where the resulting files should be placed. Finally, we will create a release definition that deploys this web deploy package to two different environments, let’s call them Test and Prod. In each environment we need to apply the correct configuration values. 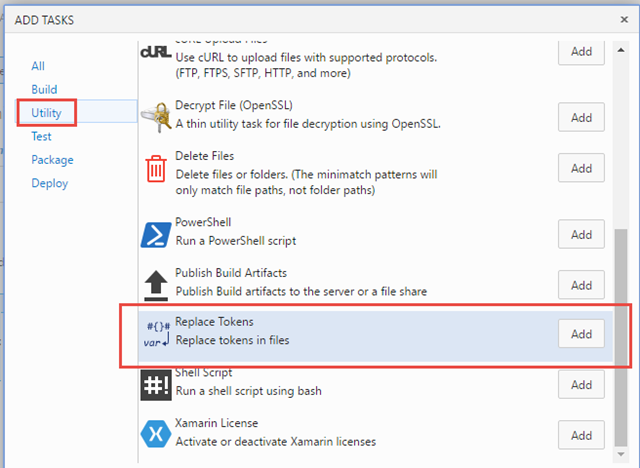 To do this, we have to replace the token variables in our MyApp.SetParameters.xml file. Each environment in the release definition will just contain two tasks, the first one for the token replacement and the other one for deploying the web deploy package. To do this, we just run the MyApp.deploy.cmd file that was generated by the build. Since the parameters have already been set with the correct values, we can just run this without any extra arguments. That’s it, now you can run the release and it will deploy your web application with the correct configuration to each environment. Last year I had a great time speaking at the DevSum conference, the biggest .NET developer conference in Sweden. Back then, I talked about moving your development to the cloud using Visual Studio Team Services. Active Solution, where I work, was a gold partner for this event and in addition to me my colleagues Alan Smith and Peter Örneholm also spoke at the conference. We had a lot of fun in our booth showing the Lego robots running on Raspberry PIs, connected to Azure for movement control and result collection. This year I had the fortune to be selected again to speak at DevSum16, and this time I will talk about the different options around integration and extensibility of the Visual Studio ALM platform. This means that I will talk about things like Service Hooks, OAuth, REST API and UI extensibility among other things. Here is the session description (http://www.devsum.se/speaker/jakob-ehn/), hope to see you there! but also homegrown systems are often used as part of the process. 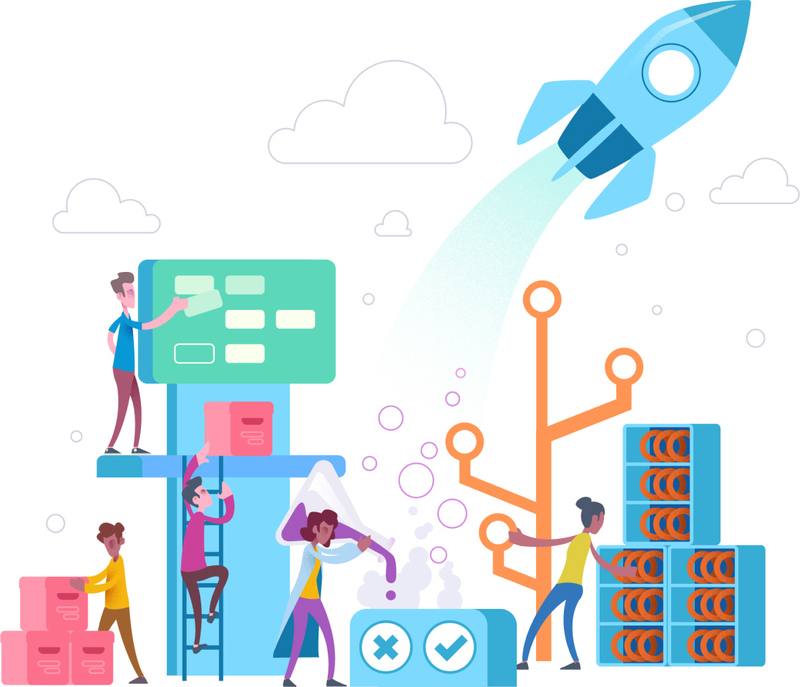 In the new era of Microsoft the term “Open ALM” is key, focusing on trying to build best in breed tools for software development companies, but at the same time make sure that it is open and extensible. Using Service Hooks to automate workflows with other services such as Trello, GitHub and Jenkins. The new build system in Team Foundation Server 2015 and Visual Studio Team Services has from the start made it very easy to integrate with GitHub. This integration allows you to create a build in TFS/VSTS that fetches the source code from a GitHub repository. I have blogged about this integration before, at http://blog.ehn.nu/2015/06/building-github-repositories-in-tfs-build-vnext/. This integration allows you to use GitHub for source code, but use the powerful build system in TFS/VSTS to run your automated builds. But, when maintaining the project at GitHub you often want to publish your releases there as well, with the output from your build. To make this easy, I have developed a custom build task lets you publish your build artifacts into a release at GitHub. To use it, just press the Install button and select the VSTS account where you want to install it. After this, the Publish GitHub Release build task will be available in your build task catalog, in the Deploy category. From Team Foundation Server 2015 Update 2, it is possible to install the extensions from the VS Marketplace on premise. To do so, use the Download button and follow the instructions. You can use any name here, this is what is sent to the GitHub API in the request header.